After a long battle with delays and a crumbling publisher , South Park: The Stick of Truth will finally complete its poop-stained trail to our PCs on December 10 in North America and December 12 in Europe. 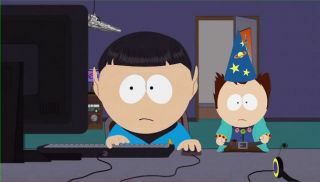 Those willing to shell out $80 can get the Grand Wizard Edition, which includes the game, a Cartman figure wrapped in wizard garb, a Kingdom of South Park map, and an Ultimate Fellowship Pack that adds four exclusive, attribute-boosting costumes. I have to admit, I'm excited for this game to come out, just so I can get a better grasp of what it actually is . We know it's an RPG that leads you in a harrowing quest to find the coveted Stick of Truth, but every trailer (including the one posted above) looks like a trailer for a new South Park movie. It's nice to know the game will be fun to watch (if you enjoy South Park) but time will tell if the game's fun to play as well.